The Teachings of Jesus Are Very Hard To Follow.. Almost ten years ago I started my first blog called RedLetterLiving. It was about living by the words of Jesus. I was concerned that even though Christianity was founded on the idea that Jesus was the Christ few current Christian denominations seemed to put much weight on his actual words. Little did I know that this study would go on for six years before I had fully answered my initial questions to at least my own satisfaction. I’m not sure when the organization Red Letter Christians was started but I think it was about that same timeframe. Two much more famous Christians than me whose names are Jim Wallis and Tony Campolo opened their website RedLetterChristians. It, unlike my site has grown tremendously since that time. I celebrate their success. Below are some words from that cite relating to our current condition of Christianity in America. Theologies that require mental assent but leave our ethics and our politics untouched have left Evangelicalism serving as the court religion for the Republican Party. Theologies heavy on Paul but detached from their roots in Jesus and the Hebrew scriptures have inoculated discipleship from the radical lifestyle prescribed by Jesus in those red letters. I find it immensely refreshing that the folks at Red Letter Christians have the guts to call out other Christians on their tepid attention to the words of Jesus. Many of the issue that the current Evangelicals support are at least to me, very antithetical when compared to the red letters. The Red Letters tell us to be our brother’s keeper, while Evangelicals support wrenching the safety net out from under the poorest of the poor. The Red Letters tell us to give the shirt off our backs to those in need while Evangelicals cling to their possessions (among them their tax dollars) in the stingiest of ways. 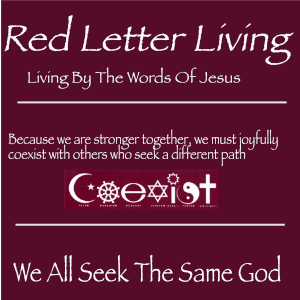 The Red Letters tell us to love our enemies when that seems to be the furthest thing on the mind of Evangelicals. How could they have possibly drifted so far astray from the words of Jesus??? I totally agree with the quote above that too much Christian, especially Protestant, theology is weighted prominently towards the words of Paul almost to the exclusion of the red letters. I agree that sticking to the red letters is probably too hard for them to do. But that is just what Jesus, the founder of Christianity, told us to do. Why are so many ignoring that basic command and seem to be inventing their own rules for calling themselves Christians?